Outstanding work! We love these benches! 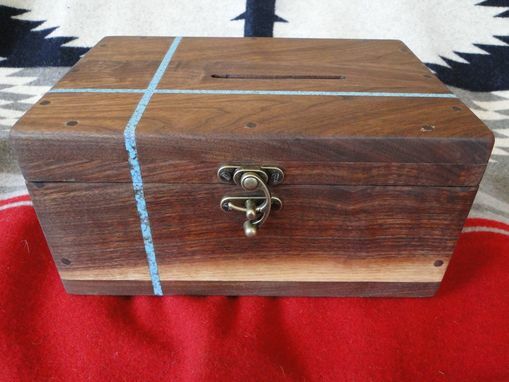 Custom Black Walnut Box With Turquoise Inlay, Black Walnut Dowels, And Antique Brass Hardware. This was a custom order for someone who wanted a box to drop her prayers, dreams and affirmations into. The box is put together without the use of screws,( with the exception of the hardware ) instead I used black walnut dowels that run all the way through in all directions. Turquoise was inlaid in two 1/4 " channels and both the lid and bottom of box are composed of three boards with opposing grain for an interesting contrast. Dimensions are 11" L x 8" W x 5.5" H.
Every maker has a story. Be a part of Dancing Cedar Woodworks's story by placing an order, leaving a review, and seeing your review appear here.